I have to say that I was happy with the results considering this is my first attempt at baking for Daring Bakers. 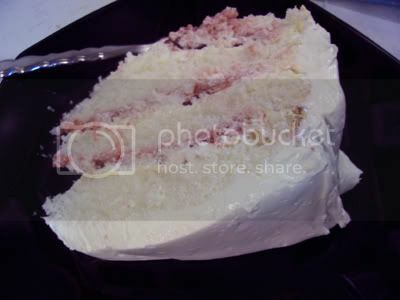 I was lucky that my first recipe turned out to be similar to the Coconut Cake that I have baked before. This month’s challenge, hosted by Morven of Food Art & Random Thoughts, is to bake Dorie Greenspan’s Birthday Cake. You see, a Daring Bakers host decides at the beginning of the month which recipe is going to be the theme that month and the rest of the group bakes the same thing and posts their recipes at the end of the month. Sounds fun, yes? I think the hardest part is keeping mum about the recipe until the posting time. At least that was my trouble. I wanted to shout out I had made my cake! but, I had to wait until March 30 to post about it. And when the end of the month came what did I do? I got busy! So it is already mid day on the last day of the month and I’m scrambling to type up my DB entry. I must mention that I am not very artistic and so my cakes tend to be very plain. I hope that by baking often enough I can maybe learn how to dress up my cakes a bit better. Some of the entries are just too awesome for words. Check out the Daring Bakers Blogroll if you don’t believe me. For my first attempt, I followed the instructions as it was given except for the coconut as the girls aren’t really that crazy about coconut. On the coconut cake that I’ve made previously, only my husband and I ended up eating the whole thing or the girls scrape off the coconut. The cake turned out quite good and I just loved the lemon flavors. However, the husband wasn’t too crazy about the lemon frosting. Something about overdosing on his grand mother’s lemon meringue pie and getting turned off lemon flavored pastries for good. So, I made a second cake, this time with Pineapple filling. I started by taking a can of crushed pineapple and cooking it down with three tablespoons of sugar so it’s not so watery and more syrupy. 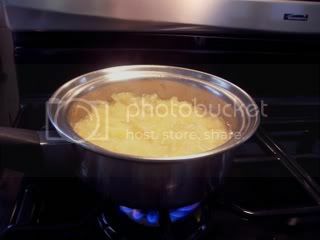 Reduce the liquids to at least half then drain off about a fourth of a cups worth of syrup and use in the frosting instead of lemon juice. I also colored the frosting yellow (hard to tell on the photos). This version was better received by the family. Now I have to learn to dress up my cakes a bit. Now you also know where I got eight egg yolks for the Classic Leche Flan I posted previously. hi Lisa! Thank you. I’m glad it turned out well too. At least I didn’t have to be embarassed my first time out. lol! hi chou, thank you, I really enjoyed this first challenge and am looking forward to the next one already! hi jenny, thank you. My family really liked the pineapple version. I don’t have Dorie Greenspan’s cookbook either. Actually, this was my first time hearing about her. Just goes to show how much I bake. hehe! you made two cakes?! meron pa? Pineapple cake = Yum! 🙂 Congrats on your first challenge! I think the pineapple is a great idea, and your cakes look good! I love the additon of pineapple. So many great flavors out there! hi leafy bombshell, thank you for the welcome and for letting me know about the color. My laptop’s monitor is really crappy I have to tilt my head and practically hang upside down to see the colors right. lol! hi airy fairy, yeah, I really surprised myself how well the icing turned out. 😀 I am definitely doing this cake again. You cake came out great! Congratulations on your first challenge! Got to the Leche Flan post first & left a message there telling you that is exactly what i would do if I had 2 make 2 party cakes!!! WOW…GREAT FIRST CHALLENGE…& twice over…BOW to you!! Very good indeed. 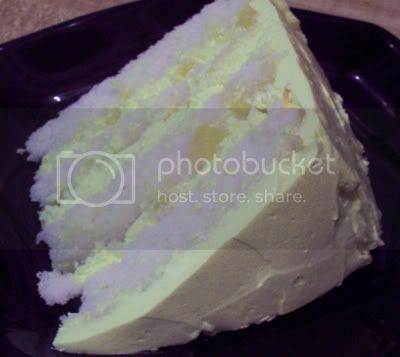 The crumb of your cake looks so moist & the frosting luscious. Welcome to Dbs! your cake looks fabulous! 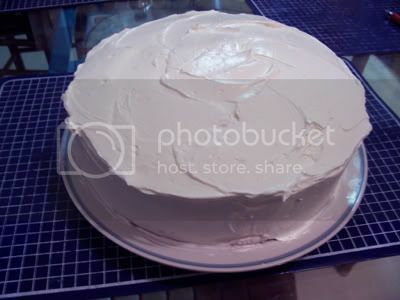 i love the shiny-ness of your icing…just lovely. wish mine had been like that! Welcome to DB and congrats on your first challenge. 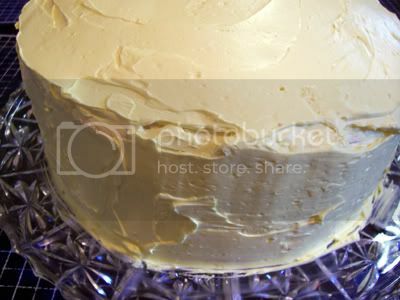 You actually can tell that the frosting is yellow on the second cake and it looks just lovely. Wonderful job! Thanks Claire! I gotta make my rounds and get some tips from other daring bakers now. I think that the pineapple cake would just be delicious! Great job!